Happy Saturday, friends!!! As a “thank you” to all of our faithful readers, we have decided that, from now on, all Frugal Farmer published e-books will be FREE! Yes, you heard it right: FREE. Zero dollars. Since much of the wisdom contained in the books was free to me, I wanted to pass that blessing on to all of our readers and visitors at The Frugal Farmer. So if you click on the “e-books” tab at the top of the home page, you’ll be able to download them all at no charge. Thank you so much for supporting our vision here at The Frugal Farmer. We appreciate you! Wow, that’s so generous. Thank you Laurie! Thank you Laurie! This is great! Wow Laurie, Thank you so much. Oh wow! Going to get your book now for my Grandson and sorry I couldn’t buy one before. Thanks, Laurie! So glad you are getting it for him, Deb!!! Hope you find some useful info in there. Thanks Laurie, that’s very generous of you! I can’t wait to read it. 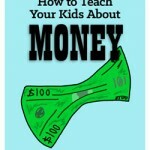 It’s definitely a topic that is important to me…will be applying those lessons when my son is old enough. Hope you find it helpful, Andrew. I so admire that you and your wife are always looking for ways to be better parents. Your son is very blessed!